The OnePlus 6T comes with an amazing 6.41-inch display and work on Android 9.0 (Pie). Its a powerful device and a dual camera setup. 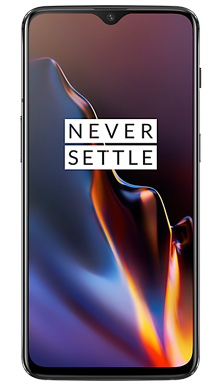 Select your desired options to find the best OnePlus 6T 8GB RAM deals for you. You would be forgiven for not having heard on OnePlus; however, this Chinese company has been making impressive mobile phone handsets for some time now and have a reputation for quality and style. With every phone they release here in the UK, their following grows as consumers realise that the technology is first rate and the price tag is perfect. The T series form their flagship range and OnePlus has made it clear that they will only release a new T series handset when they are certain technology has moved on enough for them to pack some really exciting features into the handset. November 2018 saw the release of the OnePlus 6T and media frenzy was high as we waited with bated breath to see what is in this new offering. Initial feedback was good as this is the high spec handset we had been promised. The OnePlus 6T handset is well designed and feels like a premium phone with a stunning gloss finish that comes in two colour options, both of which are black. You can choose from midnight black or mirror black, which as you might well imagine means the back of the midnight black handset is a sleek matte finish, while the rear of the mirror black, is, well, mirrored. Both of which are stunning to look at and the 6.41 inch screen is nice to hold. 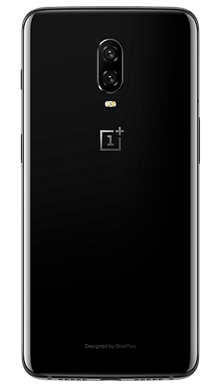 There is no headphone jack as the OnePlus 6T follows the format of many other premium handsets, but you do get the charger to 3.55mm adapter included in the box, and it features a pleasing infinity screen with just the teardrop cutaway at the top for the front-facing camera. The display is an Optic AMOLED which we know to be quality and features 2340 x 1080 pixels with 402 ppi and an aspect ratio of 19.5:9. As you would expect with a handset at this level, the glass has been well protected to ensure durability with the inclusion of 2.5D Corning Gorilla Glass 6 and sensibly comes with a pre-applied screen protector which is a smart idea. The high resolution means that this is the perfect handset for streaming movies and playing games, and the price tag makes it a competitive option. In terms of biometrics, there is a fingerprint scanner inside the screen which is a neat move and prevents the need for any other hardware cluttering up the back of front of the handset. The audio performance is good, as already mentioned to use wired headphones you will need the supplied adapter, but of course, Bluetooth is a reliable alternative for when you are out and about. The sound quality through cans is good, and without, just relying on the speakers you will have more than enough sound to hear your film or take a call handsfree. 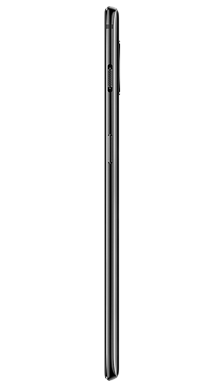 On the rear of the OnePlus 6T, you will find a dual lens camera arrangement. The primary lens is 16MP while unusually the secondary is bigger at 20MP; however, the joint performance is what matters, and this is good. Low light photography is stunning, and the supporting technology and dual LED flash ensures that you get a great image every single time. The front-facing selfie camera is more substantial than many others on the market at an impressive 16MP which serves you well when taking a front picture. The video recording capability of both the front and rear camera is really great with super slow-mo and other features available. So inside the hood, as you would expect the performance power is certainly all there. This is a Qualcomm Snapdragon 845 (Octa-core, 10nm, up to 2.8 GHz), within AIE that runs the latest Android Pie operating system. It has 8Gb of RAM and either 128GB or 256GB of storage depending on the handset you choose. This is a nice sensible amount that means most people will have more than enough space for all the things they need to do. The handset comes with a fast charging adapter and cable and the company promise a charge time of just 30 minutes. There is no wireless charging support although with such a fast charging time it is of little consequence to be fair. The OnePlus 6T has a decently sized 3700mAh battery which means you should more than cope with a full day away from the charger. The battery is fixed so you would need a power cell adapter if you find this isn’t enough but to be honest that shouldn’t be an issue. This handset does not include enhanced biometrics such as facial recognition, but the on-screen fingerprint sensor is very secure and does a great job, the handset has really been well designed, and they have not wasted resources on features we can live without. Overall the OnePlus 6T is a seriously high-end piece of kit, and thanks to the smart planning the price tag really stands out for those looking for a high-performance Android handset. It knocks spots of many others and is already proving to be massively popular. If you are looking for value without lack of feature and performance, the OnePlus 6T is a really good choice. Here at Fonehouse getting the best deals is what we care about, even on new release handsets we are determined to make sure you have the best range of deals possible to choose from, and we are committed to making sure as many as possible come with no-upfront cost to the user. We partner exclusively with EE and Vodafone because we also believe that they offer the best network connectivity and they both offer some really amazing deals and network extras to make sure you really are getting the most for your money. 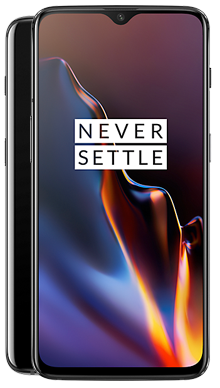 If you are considering the OnePlus 6T and have any questions about any of the deals then why not give our customer service team a call on 0333 900 1133 and they will be delighted to help.